Bariloche was my home for many summers and a couple of winters. Even though I’ve never had the glamorous experience of skiing, I did see (and feel) the beauty of snow covered pines and frozen faux doc martens. (Yes, do take good shoes, but there is nothing that a cup of hot chocolate from Mamuschka can’t handle). Even as I write this, I’m so distracted by the scenery in my window, It is so beautiful. Puerto Petunia Resto Bar: live music, nice beach, great seafood! The sun sets late in summer, so go at 8pm to fully enjoy it. Also, Puerto Petunia Bar is behind a camping space, don’t let that stop you, follow the road! Puerto cafe: A remarkable (medium rare to perfection) ojo de bife sandwich (with tomato, lettuce and actually good bread) for AR$90 (US$10*). Take it to go. 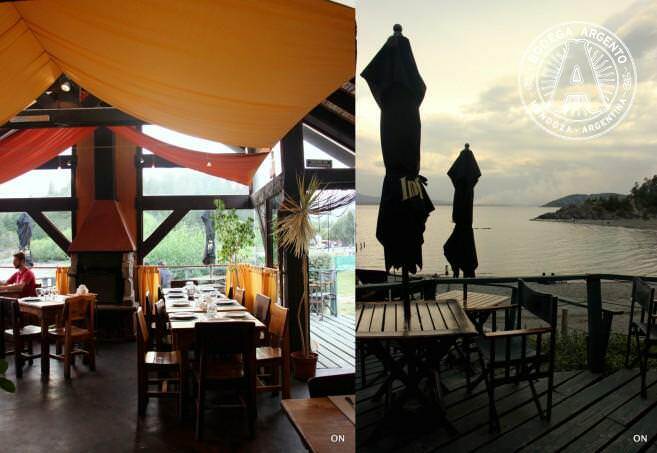 Cassis: Named (a few times) the best restaurant in Patagonia. 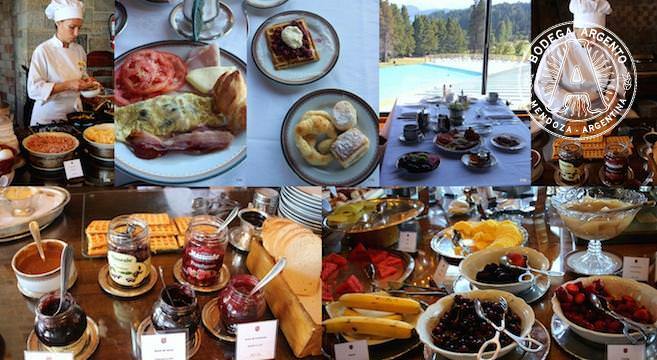 This seven course meal is, for sure, one of the bests you’ll have in Bariloche. Welcoming you with a glass of Sauco (elderberry) flowers sparkling wine. Following with a selection of paté, chutneys, smoked butter for appetizer. A salad with vegetables from their garden dressed in their homemade vinegar (I actually bought some to take home, excellent!!). 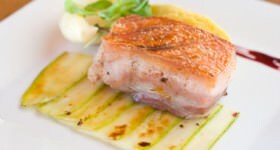 Some of the delicious food at Cassis; photos by Olivia Najt. Trout and green apple tartar with citron granita as one of the appetizers, Hare with shallots for an entrée, and for dessert a dark chocolate brownie with caramelized pistachio and wild edible plant sorbet. Another thing that makes this place special, is their knowledge and love for edible wild plants, prepare yourself to be surprised. 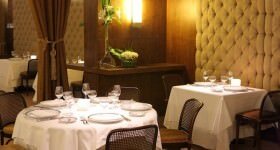 Mariana and Ernesto, the couple that owns Cassis, will be moving the restaurant in September 2015 (approximately) to a different location. If you intend to go by then, it will be a different and rich experience, expect to make your own vinegar! Llao Llao Hotel; photo by Olivia Najt. 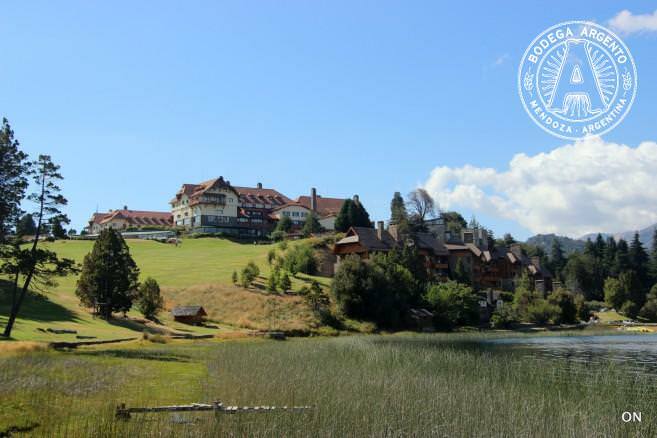 Llao Llao, the famous hotel is a national jewel for it’s strategic location. One of the best views ever (two mountains, and two lakes in one window…yeah, no big deal). 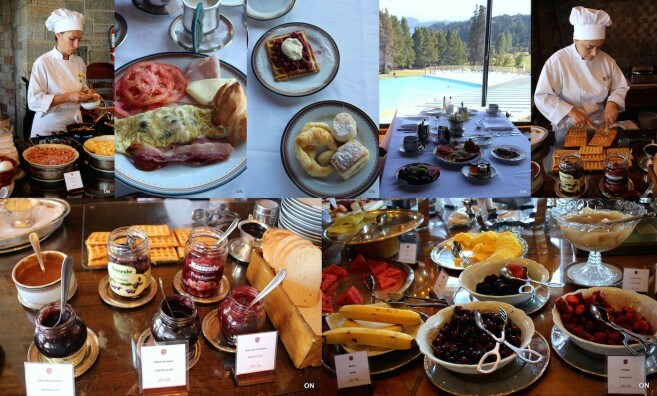 Breakfast at Llao Llao Hotel; photos by Olivia Najt. The best deal, for me, its “the salad buffet” at the Winter Garden (floor to sealing windows). A few examples: Amazing cheeses, smoked salmon, octopus and potatoes salad, two hot dishes that change every day, chutneys and every salad dressing ever. Oh, yeah, and solid petit desserts as well. And did I mention that you can have as many as you like? Yes! AR$319 per person or AR$580 for 2 (US$35.40* and US$64.40* respectively). The Winter Garden at Llao Llao ; photo by Olivia Najt. Tea at Llao Llao is also a possibility. The classic tea, with small sandwiches and top notch sweets. AR$319 per person or AR$580 for 2 (US$35.40* and US$64.40* respectively). Lunch and Tea at Llao Llao; photos by Olivia Najt. And for a special treat, dinner at Los Césares. Dishes like “Leaves and flowers from the garden, king crab and gazpacho” or “Duck magret, endives braised in oranges and saffron” are a beautiful way to end your night. Recommendations: Make reservations beforehand, and when you call, ask for the dollar price. Also, children under 12 get 50% off. Bellevue and it’s beautiful view; photos by Olivia Najt. 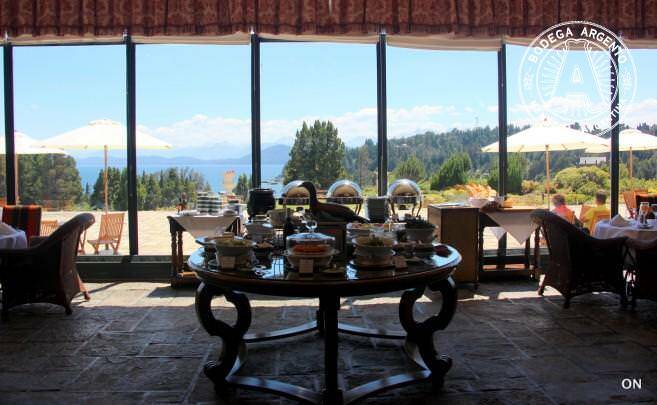 Bellevue: The ultimate garden in Bariloche. It is a teahouse so go early, around 4pm, when it opens. Get a table outside (the inside isn’t so welcoming). Homemade cakes, fresh raspberries for good smoothies, and salty plates like warm brie. Don’t miss it. Located at 24.6KM on Bustillo, look out for the sign and follow the path. Bahia Serena inside and out; photos by Olivia Najt. Bahia Serena: Accessible location for a restaurant. This small bay is next to Bustillo Avenue. Sit outside and enjoy the sunset views. And go for the homemade pastas, the best are the deer panzotti with mushroom cream sauce and the chicken curry crepes. Good desserts as well – they take a while because they heat them up to order. 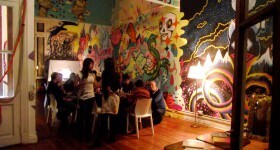 Fonda del Tío: Low key, family style restaurant. Immense portions, one milanesa napolitana (tomato sauce and cheese) for 3 people, please don’t go alone. Kandahar: Family run restaurant, serving great dishes like trout cooked in butter with a carrot and orange pure, or beetroot gnocchi with crispy sage. Check out the menu. Tronador: For really good food to go. 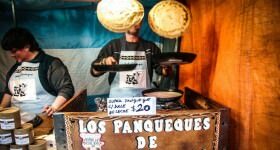 Great meat empanadas, crispy fries, good potato tortilla, bife de chorizo, and other good options. 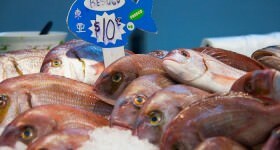 Ahumadero Weiss: They sell their products in big supermarkets; easy to find. Smoked fish, meat and cheese mainly (smoked salmon paste, a little dry but good with bread). Medialunita for the best medialunas, laminated with goodness (butter) and drenched in syrup, soooo good. 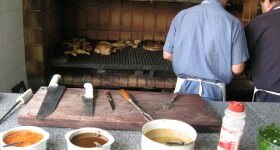 Actually, I recently found out that medialunas in Bariloche are good almost everywhere. La Peninsula: These jams are all great. Locally grown, harvested and cooked (by what I imagine, an old lady). Raspberry is my flavour, but there are blueberry, cherry, elderberry, plum, etc. Believe me, take some jars home. Chile is so close by that you are likely to see their produce in supermarkets. Like anchovies…. hmmmm anchovie butter. Wild berries (summer only): Just like the world should be, you won’t get the best wild fruit in Bariloche in a supermarket. You’ll find it while taking a hike, going to the lake or even beside the road. When you find it, STOP EVERYTHING, get out of the car, stray a little from the path, and look around, feel if they are ripe, have good colour and have no bird bites, grab a bag and fill it up! Enjoy! Think of cherries, amazing raspberries – like you’ve never had– (unless you’ve been here before; the conditions everywhere affect their taste), blackberries and others. Jauja: I love their ice-cream. White chocolate and so many berry flavours (weird ones as well, like mate cocido con 2 de azucar). Rapa nui: Buy some dark chocolate Fra-nui (chocolate covered raspberries), the milk cover is too sweet. Mitre 202 and more locations. Alun-Co: I’m not someone that usually recommends water. But this one is so good that got a special place in my heart. I’m told you can only get it in restaurants, but soon they’ll make drums for camping. 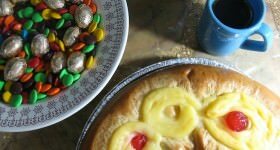 Mamuschka: for the best chocolates, bonbons, hot chocolate and cakes. Great medialunas as well. Thank you Mamuschka, you saved a few cold winters for me (and I think I’m not alone in this one). Mitre 298 (esquina Rolando) – San Carlos de Bariloche. Congratulations Emiliano Schobert and his great team for representing Argentina in the Bocuse d’Or and earning the 15th place! Get to (maybe) meet him at his culinary school in Bariloche, El obrador. *Dollar price approximation: US$1.00 = AR$9 pesos. Olivia, born and raised in Buenos Aires, loves blogging, eating and watching movies. She learned English through music and her family; at the age of five she was singing and dancing to the Beatles. Olivia currently works as a freelance photographer and writer in places like The WOW Factor and her own blog Olive's Food Project. She also goes to Pastry school and dreams about going to Japan.